HOLIDAY INN RECORDS – This label was part of the Holiday Inn chain and was an American record label, founded by D. Wayne Foster in 1961. It was initially intended as a creative outlet for Wayne Foster and Kemmons Wilson, as an independent business venture. Foster ran the label between 1961 and 1963. Sam Phillips of Sun Records later ran the label on behalf of Wilson. In 1961, D. Wayne Foster discovered a musical group named The Roller Coasters. Foster brought the group to the Owen Bradley's Studio in Nashville, Tennessee to record. The group recorded two songs, "Rim Shot, Part 1" and "Rim Shot, Part 2" this instrumentals already sold over 6000 copies in Memphis and New Orleans after eight days and was picked the "hit of the week" on WMPS in Memphis and WPLO in Atlanta, according to Foster. By June, more than 50.000 copies were sold it was number 1 in Monroe, Louisiana, and presumably other cities. Foster created Holiday Inn Records to distribute the single. Holiday Inn Records recorded a number of acts that Foster personally discovered, and in most cases he would be involved in the recording sessions, assisted by Neal Matthews Jr. of the Jordanairs. Records were mainly pressed by Plastic Products in Memphis, although the label also used RCA's custom pressing service. By 1962, Holiday Inn expanded its promotion activies and hired Chips Moman for production. The Rollercoasters were still on the label, as well as a new singer called Jimmy Foster. Buck Griffin and Frank Starr, who is known to rockabilly collectors as Andy Starr, also recorded some singles for the label. While Holiday Inn used recording studios in Memphis at the beginning, they were branching out by 1962, cutting sessions in Nashville for example. By 1963, Foster was devoting only a small amount of time to devote to producing records for the label, as he had many other, more profitable business ventures. After producing eleven more records, Foster decided to leave Holiday Inn. This left Wilson needing to find someone to run Holiday Inn Records. He asked his old friend, Sam Phillips, of Sun Records. Since Phillips had invested in the Holiday Inn Hotel chain earlier, and in the spring of 1968, Sam Phillips was announced as being the president of Holiday Inn with brother Judd being national sales and promotion manager, Bill Fitzgerald became general manager, Judd's son Judd Phillips, Jr., became regional sales and promotion manager, and Sam's son Knox worked as producer. Phillips became the head of the new Holiday Inn label mainly because he was a major stock-holder of the Holiday Inn motel chain and seemed to be perfect for this job. By then, Phillips was in process to sell his Sun/Phillips International catalog to Shelby Singelton. Several unreleased masters, who were not part of the deal with Singelton, were later issued by Phillips on Holiday Inn. Around the same time, new artists such as Jerry Dyke, the Climates, Gregg Todd & the Jacks, Load of Mischief among others were signed, a studio was set up in Memphis, and the new office was at 3756 Lamar Avenue, Memphis. Though, the label still belonged to the Holiday Inn motel chain. Billboard called the label "newly founded" in its March issue, which leads me to the suggestions the label was closed down for some time after 1962 and was revived in 1968. This would also explain why there were no singles in the mid-1960s and the change in the numerical system. Already in February 1968, the label released the first album on the new incarnation by Dotty Holyday. In November that year, Rev. Oris May joined the label as a A&R manager and regional sales and promotion manager. Soon afterwards in December, he was out promoting Larry Brinkley's newest single. Brinkley previously recorded rockabilly in the late 1950s and 1960s. Although the label seemed to expand, there was one big problem for Holiday Inn. Many radio disc jockeys across the country would not play Holiday Inn records because in just saying the name "Holiday Inn" over the air amounted to free publicity for the motel chain and most if not all radio stations programmers refused to do so. The last record released on the label was by Gregg Todd and the Jacks in 1969. 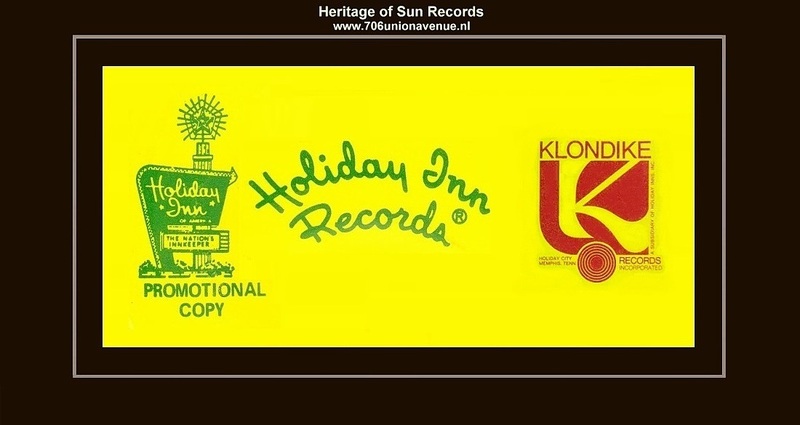 KLONDIKE RECORDS - was a subsidiary of Holiday Inn Records. Holiday Inn Records was founded by D. Wayne Foster and Kemmons Wilson in 1961. At this time, D. Wayne Foster was Holiday Inn’s National Contract Sales Manager. The cause for the start of Holiday Inn Records was Foster’s discovery of a group named The Roller Coasters.